Drambuie is a honey- and herb-flavoured golden scotch whisky liqueur made from aged malt whisky, heather honey and a secret blend of herbs and spices. The flavour suggests saffron, honey, anise, nutmeg and herbs. The alcohol by volume of this liqueur is 40% (80 proof). The name Drambuie comes from the Scottish Gaelic phrase an dram buidheach, meaning "the drink that satisfies". It was coined first at the Broadford Inn in 1893 where it was sold to patrons. After the battle of Culloden (1746), Prince Charles Edward Stuart fled to the Isle of Skye. There, he was given sanctuary by Captain John MacKinnon of Clan MacKinnon. According to family legend, after staying with the captain, the prince rewarded him with this prized drink recipe. (This version of events is disputed by historians – some believe it to be a story concocted to boost sales of the drink). 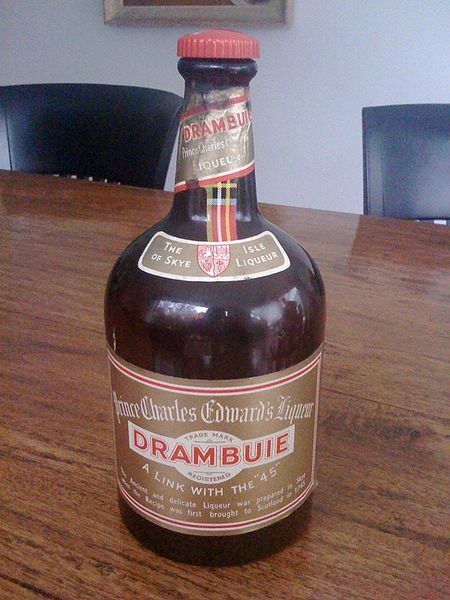 The first commercial distribution of Drambuie, in Edinburgh, was in 1910. Only twelve cases were originally sold. In 1916, Drambuie became the first liqueur to be allowed in the cellars of the House of Lords, and Drambuie began to ship world-wide to stationed British soldiers. To celebrate the 100th anniversary of Drambuie being bottled in Edinburgh, the makers launched a new style of bottle and embarked on a television and print advertising campaign in 2010. Drambuie can be served "neat" (at room temperature with no ice), on the rocks, or used as an ingredient in a mixed drink, such as the rusty nail cocktail (see below). It can also be served as a flaming Drambuie. The honey in Drambuie can cause the cap to seize to the bottle in as little as twelve hours, making it almost impossible to reopen by hand. This is the likely origin of the term "Drambuie strength", as it can seem as though the last person to open the bottle closed it very tight. A Rusty Nail is made by mixing Drambuie and Scotch. Many prefer less Drambuie to decrease the sweetness of the drink. Scotch has a fairly biting and hot taste that is counterbalanced by the honeyed, herbal overtones of the Drambuie. A Rusty Nail can be served in an old-fashioned glass on the rocks, neat, or "up" in a stemmed glass. It is most commonly served over ice. A Rusty Nail served without ice is sometimes called a Straight Up Nail. First fill a 16 oz glass with crushed ice until it is overflowing. Pour in 5 parts drambuie and 9 parts scotch. Stir gently, as to not bruise the ice. Keep stirring until a thick frost develops on the side of the glass. Garnish with a lemon twist. Serve.